Report highlights British American Tobacco’s progress on its ambition to transform tobacco with a range of potentially reduced-risk products. 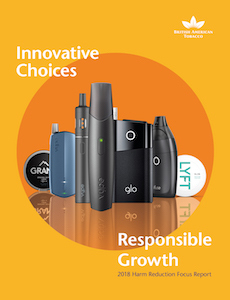 British American Tobacco’s strategy of transforming tobacco by seeking to provide consumers with satisfying, reduced-risk alternatives to smoking is the focus of its latest report, available now. This new report highlights BAT’s continued commitment to contributing to tobacco harm reduction. It demonstrates how the company has made tremendous progress in its long-held ambition to provide consumers with less risky tobacco and nicotine choices. Adult consumers are offered a much broader range of alternatives than ever before, including vapour products, tobacco heating products and oral tobacco and nicotine products in 28 countries globally. The report also focuses on how the company is maximising the potential of its products to contribute to harm reduction by continuously investing in innovation, building reliable evidence backed by robust science, and driving responsible growth of the industry through collaborative efforts. “But these products can only meet their potential if the right regulatory and market conditions are in place. Stakeholders from across government, industry and public health need to continue to work together to create an environment for tobacco harm reduction to be successful. Expert viewpoints from BAT’s senior leadership: Nicandro Durante, BAT’s Chief Executive, in which he comments on BAT’s progress in its commitment to harm reduction under his leadership; and Dr David O’Reilly BAT Group’s Scientific and R&D Director, in which he shares his views on the transformation of the tobacco industry and what it means for BAT. An expert stakeholder viewpoint from Dr. Saul Shiffman, a Professor of Clinical and Health Psychology, who has been conducting behavioural research on nicotine and tobacco for 45 years. Information on BAT’s diverse range of Potentially Reduced-Risk Products (PRRPs) – from vapour products, tobacco heating products, to oral tobacco and nicotine products – which are now available in 28 countries globally. An overview of the scientific assessment framework BAT has developed to assess the reduced-risk potential of its products. A reference to the growing body of independent evidence that demonstrates the reduced risk of emerging tobacco and nicotine alternatives to smoking. The importance of effective regulation, including product quality, and safety standards. BAT’s continued commitment to tobacco harm reduction – how it will continue to invest in seeking to develop less risky alternatives to cigarettes, provide sound science behind its products, engage with regulators to raise awareness about the potential benefits of PRRPs, and responsibly market its products to adult consumers looking for potentially less risky alternatives. To download the report, go to www.bat.com/sustainabilityfocus. British American Tobacco (BAT) is a global tobacco and nicotine products company. Its brands are sold in more than 200 markets and it employs around 55,000 people worldwide. BAT’s cigarettes are chosen by around one in eight of the world's one billion adult smokers and its five Global Drive Brands are Dunhill, Kent, Lucky Strike, Pall Mall and Rothmans. Alongside its traditional tobacco business, BAT is developing a portfolio of innovative next generation tobacco and nicotine products to offer consumers a choice of potentially less risky alternatives to conventional cigarettes. BAT is market leader in over 55 countries and in 2016 the Group generated reported revenue of £14.75 billion and adjusted profit of £5.48 billion. In July 2017, British American Tobacco p.l.c. acquired the remaining 57.8% of Reynolds American Inc. that BAT did not already own, creating a stronger, global tobacco and Next Generation Products company. Harm reduction is a well-established public health concept that seeks pragmatic ways to minimise the impact of an inherently risky activity without stopping it entirely. Our approach to tobacco harm reduction focuses on enabling adult smokers who want to continue consuming tobacco or nicotine to use products known as potentially reduced-risk products (PRRPs). We use the term PRRPs to cover tobacco and nicotine products that, based on the available science, have been shown to be reduced-risk; are likely to be reduced-risk; or have the potential to be reduced-risk, in each case if switched to exclusively as compared to continuing to smoke cigarettes.